We like to cover many types of books here at Reader Girls and though our brother isn't a reader girl (haha), he's a reader. At seven, he's at the place where he is beginning to say he's getting too old for picture books. Mom tells him there are all types of picture books, for different ages, and one of the last ones we received for review has suddenly become his favorite. Like so many of us, some picture books are ageless and timeless. Take Dr. Seuss' Green Eggs and Ham or The Cat in the Hat, It's a Book by Lane Smith, and countless others. They don't have to be lauded as 'classics', they just have to touch you as being something special. Besides, you don't have to be a youngster to be enchanted. 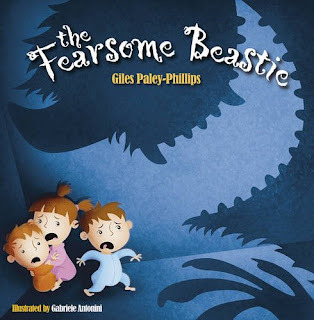 The Fearsome Beastie by UK author Giles Paley Phillips has enchanted all of us. Once we began to read this story out loud, we were all taken by its lulling rhyme, which immediately drew us to Gabriele Antonini's colorful and inviting illustrations. We marveled at how these pictures truly represented and brought the story to life. The Fearsome Beastie is a quirky tale about those nighttime sounds kids hear when they go to bed. What if those noises belonged to something big and blue and...beastie? Reminiscent of The Brothers Grimm tales and featuring a fearsome grandma, this story may not be suitable for children who spook easily, but for others they're sure to think, imagine, and delight in this offbeat tale. Book blurb: The fearsome beastie is searching for something to eat and the children are at the top of the menu. Will they be fooled by the fearsome beastie and his clever tricks? 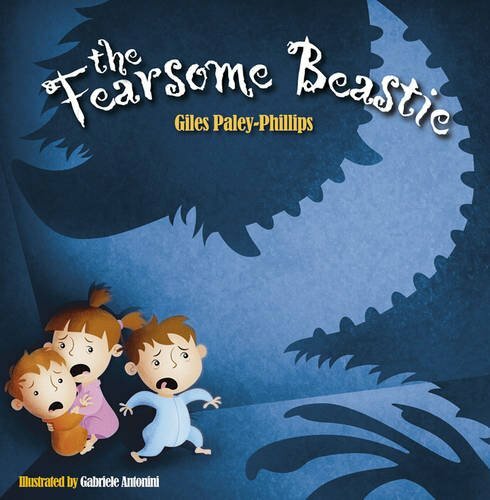 The Fearsome Beastie is a brand new title by poet Giles Paley-Phillips. Written in rhyme, this story is reminiscent of the cautionary fairy tales of the past but with a happy ending! 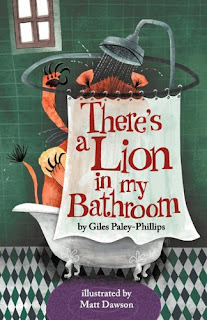 We welcome author Giles Paley-Phillips today and hope our readers will discover this gem of a picture book by this fabulous author. From what I've read about you, you're a poet so why children's books? My first book was nonsense poetry, so I guess I became known as a poet, I love poetry and I do adopt poetic forms in my writing, like rhythms and meter, but I do prefer to think of myself as a children's writer, rather a poet. What or who was your inspiration? My children are a huge inspiration, in that, I want to write books I think they will enjoy, but as regards to writers or books that have inspired me, I would have to say that I do find myself drawn to the macabre, the work of Edward Gorey, Tim Burton and Roald Dahl's revolting rhymes were a big influence. Did you find the experience difficult or easy? Writing in rhyme can be a real challenge, but I do enjoy it more than straight prose. There's a Lion in My Bathroom was written over a few of months, but The Fearsome Beastie I virtually wrote in a day. Unfortunately I'm not a great editor, so that part where tweaking lines and smoothing things out, I find very tricksome! Your rhyme breathes such life into the story, how long did it take you to finish? The main bulk if the text I wrote in a day, but then I left it alone for a while and returned later to iron out the creases. How long did it take from your completing the story to seeing it printed? What was your initial reaction? Getting your work published can be extremely hard and it took sometime for The Fearsome Beastie to find a suitable home, but I've been very lucky, all my publishers are fantastic and very supportive of my work. What, if any, do you hope your readers will take away from this book? I just hope they find something a little bit different to other children's books that are on the market and that they want to read them again. Do you see any challenges in reaching for a broader market outside of the UK? I think some publishers and agents are a little wary of The Fearsome Beastie as it's a little unconventional and scarey for a picture book, especially in the US, but I have to say I've received lots of messages from folks in the states and they seem to have really taken to The Fearsome Beastie! So I think there could definately be an appeal for it outside of the UK, but we might have to get it out there without any support from publishers in those countries. Not sure, I'm not sure where I can go with it! However I am working on another book which will be a bit dark and scarey! I have a picture book next spring with Gullane Children's Books called Things You Never Knew About Dinosaurs. Giles Philllips-Paley was born in East Sussex and grew up on the south coast. He neglected his education to pursue a career in music. He spent a number of years performing extensively around the UK, including slots at the Glastonbury festival. 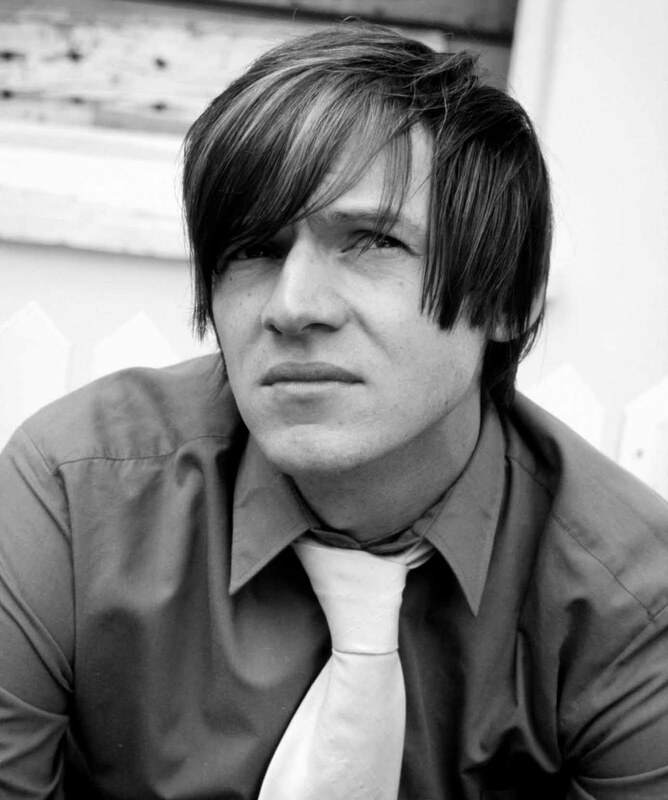 In 2006 Giles released a collection of lyrics and poems in aid of Leukaemia Research, a charity dear to his heart, having lost his mother to the disease when he was six. After the birth of his first son, and a chance encounter with a collection of nonsense poetry by Shel Silverstein in a charity shop, he was inspired to turn his attention to Children’s writing. His debut picture book, The Things You Never Knew About Dinosaurs, will be published by Gullane in 2011. Further titles include a collection of nonsense poetry, There Is A Lion In My Bathroom (Rebel books 2010, with proceeds going to Leukaemia Research). Giles still lives in Seaford with his wife, Michelle, and their two sons, Elijah and Sonny. One reader will receive an autographed hardcover copy of The Fearsome Beastie. Answer one question: What were you scared of as a kid (or for parents, what are your kids scared of)? We will choose one commenter so please leave your email along with your answer. This contest is open internationally and will end on Saturday, October 1. Reader Girls thanks Giles Phillips-Paley. Our review will be up shortly. Ok this is embarrassing but here goes: I am afraid of Michael Myers. No not the actor (although his teeth were pretty scary in Austen Powers), but Michael Myers from the movie Halloween. I saw this movie when I was really young, maybe 5ish, and I have been terrified of him ever since. I have to sleep with the lights on after watching this movie. Just the thought of him is enough to freak me out. A few years ago on Halloween I almost got in a car accident because there was someone dressed as him on the sidewalk and I just happened to glance over and see him while driving by. I screamed, and I may have swerved a little :) It' really pathetic, but I just can't get over it. I may need therapy lol. I was scared of my parents getting a divorce. I was scared of heights..and I still am, haha! As a kid, I was always scared of the boogeyman under the bed. I would switch off my light and take a flying leap onto my bed so he couldn't grab my ankles when I stood near the bed! My kids have captain's beds (with the drawers underneath), so they don't have the same problem. I think I must have had that in the back of my mind when I bought the beds, LOL! I had a disgustingly happy childhood - no hang ups to report. My children are pretty level headed as well. Nothing to keep us up at night. Thank goodness for that I say. Fabulous interview! It's encouraging to hear that it took a while for this book to become published, because it encourages writers to be patient and determined. Never give up! I was scared of the bathroom! Probably alot of kids were - mine was due to my oldest sister making me watch some scary movies. I would always go in there and leave the door open and if I was in the tub I would shout for my middle sister to come please sit in there with me. There was also the boogie man under the bed fear - I thought there was a huge spider who left big long legs dangling out around all edges of my bed ready to grab me if I got up in the middle of the night to tinkle. Snakes, oh my gosh I used to have some terrifying dreams about them. I have always been scared of heights. I was scared of the dark. Think it was because a friend of mine and I watched Dracula on late night when we were way to young to do so. I was always scared of swimming in lakes because I was afraid of being bit by fish and turtles. I still am a little! spiders! walking in one someone watching arachnaphobia as a child was NOT a good thing!! I was scared of the dark. My kids were both scared of the toilet monster. At night the cover had to be down or the monster might come out and get them. Not sure where they got that from. I'm scared of huge spider. Little ones don't bother but bigger than a quarter and I freak. My daughter isn't scared of anything except grasshoppers. I was scared of the dark. So, I always slept with a nightlight. I was scared of snakes and eating in front of boys on dates, now I'm married and have two son-and I'm not scared at all. Thanks for sharing with us everyone. VMKIDS3 has won the book. Congratulations!